Spectacular views without the switchbacks. Save your knees and walk for miles along the rim of the Grand Canyon. The Rim Trail stretches for over 13 miles along the rim of the Grand Canyon. With 14 shuttle stops spread out along its course, you have options abound. Hike part of it, or hike all of it. Distances between shuttle stops range from 0.3 to 1.8 miles. 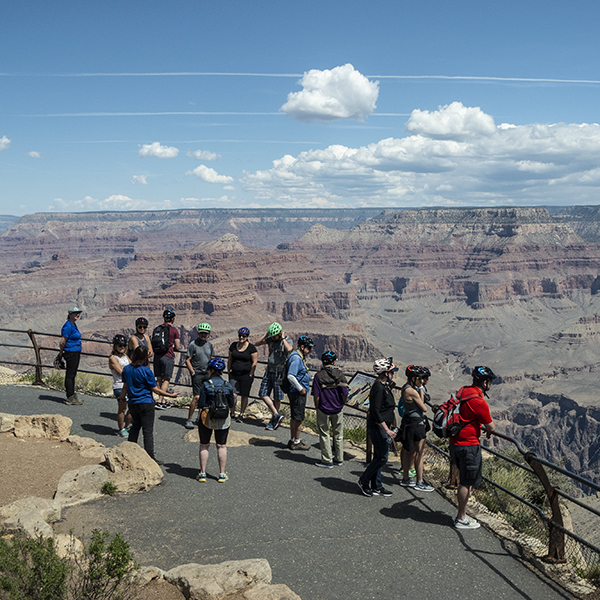 When your feet get tired, simply hop on a shuttle bus and ride back to Grand Canyon village. Sections of the trail are wheelchair and bike accessible, plus it’s the only trail in the park that you can walk with your dog. It’s pretty simple: Ride a park shuttle bus (red, blue, or orange) to any of the viewpoints, get out, and start walking. The viewpoints are described below (from west to east) to help you decide which sections of trail to hike. Hermits Rest is a stone building designed by Mary Colter that was originally built for the Santa Fe Railroad. Today, it’s a National Historic Landmark and has a snack bar and small gift shop. Amenities include: restrooms, drinking water, vending machines, and picnic tables. The trail from here to Monument Creek Vista is paved. From Pima Point, enjoy views of the Hermit and Monument creek drainages, Colorado River, inner granite gorge, tight switchbacks of the Hermit Trail, sections of the Tonto Trail, and Granite Rapids. This is a two-way stop (you can catch the bus here and ride back towards the village). As the name implies, you see great views of the Monument Creek drainage. Try to spot the Tonto Trail, which snakes several thousand feet below you. The paved section of trail begins/ends here, depending on which direction you travel. From Monument Creek Vista to Powell Point, the trail is unpaved. It’s a sheer drop down the cliffs at the Abyss viewpoint. Gaze down the Monument Creek drainage and glimpse the Colorado River. The Rim Trail between the Abyss and Mojave Point is the best picnic stretch, with at least four picnic tables spread out along the way. You also get the most magnificent views, including the Colorado River, Hermit and Granite rapids, the Monument Creek drainage, and the Tonto Trail. This is a popular place to watch the sunrise and sunset. Soak in fantastic views of the granite gorge, Hermit Rapids, the Salt Creek drainage, and a glimpse of Horn Creek Rapids. This is the only stop along the red shuttle bus route that has toilets. Powell Point is named after John Wesley Powell, who floated down the Colorado River in 1869. A paved trail leads out to the end of a promontory, where a monument honors him and his journey. From Powell Point, it’s a short walk between neighboring vistas, and the trail is paved the rest of the way east to the South Kaibab Trailhead. Peer into the Horn Creek drainage and see old mining equipment that remains from the Orphan Mine, a uranium mine that operated on the South Rim until 1969. From Maricopa Point, you can also see the Plateau Point trail several thousand feet below you. From here, you get the best views of the Bright Angel Trail and the South Rim village. Water and restrooms available. The stretch of trail between Bright Angel Trailhead and Verkamps Visitor Center pass several historic buildings, including Bright Angel Lodge, El Tovar, the Kolb Studio, and the Hopi House. Treat yourself to an ice cream cone from the Bright Angel Fountain, and poke your head in the various gift shops and buildings. Feet tired and need to get somewhere within the village? Pick up the blue bus route here. Pop in Verkamps for park information, history exhibits, a walking timeline of the Grand Canyon community, and a bookstore/museum shop. 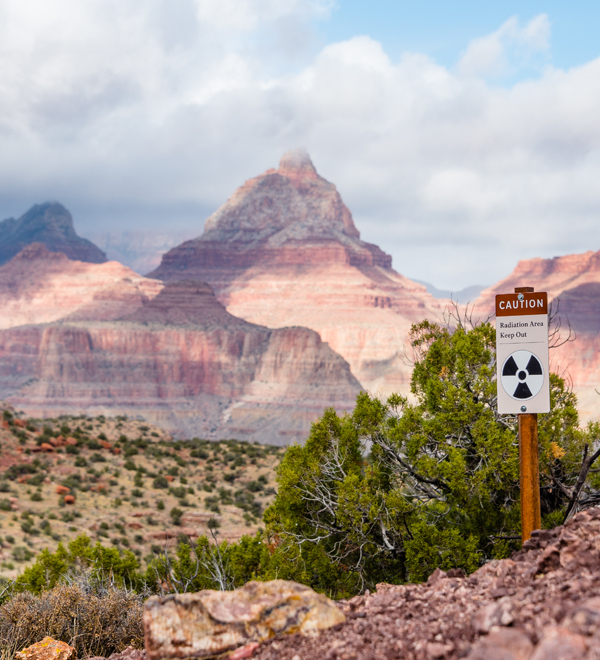 The trail between Verkamps and Yavapai Point is known as the “Trail of Time.” It is an exhibit of rocks found within the Grand Canyon, spaced to convey the magnitude of geologic. Explore Yavapai Geology Museum to learn how the Grand Canyon was formed. Water, toilets, and a small gift shop are available. Just a short walk from the main park visitor center, Mather Point is the most crowded viewpoint and also where most people see the canyon for the first time. Given how many people visit Mather Point, it’s surprising how few walk along the rim trail to Pipe Creek Vista. Enjoy relative solitude and canyon views. This is where the South Kaibab Trail takes plunges down into the depths of the canyon. Restrooms and water are available here. Some sections of the Rim Trail take you close to the edge of sheer cliffs with no guardrails. Watch your children. The rim trail between Hermits Rest and Bright Angel Trailhead has some of the best views and fewest people. Take the red route to access these viewpoints. The red bus makes 9 stops on the way out to Hermits rest, but only three on the way back (Pima Point, Mojave Point, and Powell Point). Plan your hike accordingly. There is no water along the trail. Water is available at Hermits Rest, Bright Angel Trailhead, within Grand Canyon Village, and the South Kaibab Trailhead). Shuttle buses start running one hour before sunrise and continue one hour past sunset and come about every 15 minutes. Check park information for the current schedule.